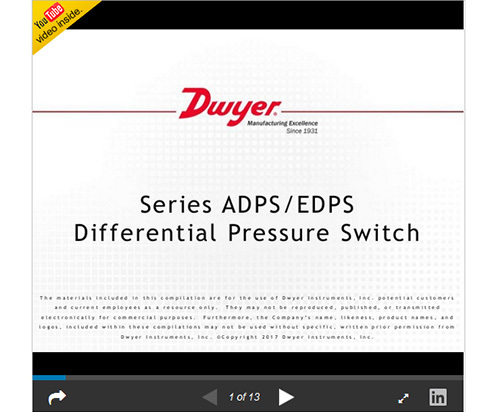 The Series ADPS/EDPS Adjustable Differential Pressure Switch is designed for pressure, vacuum, and differential pressures. The dual scaled adjustment knob in inches water column and pascals allows changes to the switching pressure to be made without a pressure gage. The ADPS/EDPS is available with settings from 0.08 in w.c. (20 Pa) up to 20 in w.c. (5000 Pa). 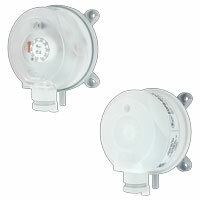 The silicone diaphragm and PA 6.6 body make the series ADPS ideal for use with air and other noncombustible gases. 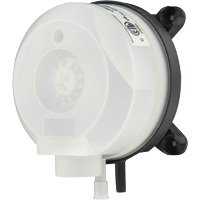 Series EDPS models meet UL508 and are constructed of plenum rated plastics. 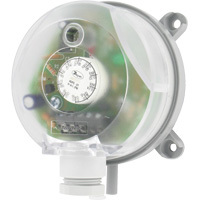 The compact size, adjustment knob and low cost make the ADPS/EDPS the perfect choice for HVAC applications. 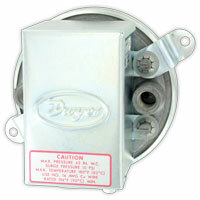 Please see SERIES AT1ADPS for ATEX approved. Monitoring air filters and ventilators. 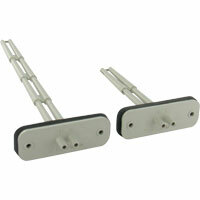 Overheating protection for fan heaters. Monitoring flows in ventilation ducts. Controlling air and fire-protection dampers. Frost protection for heat exchanges. Air and non-combustible, compatible gases. 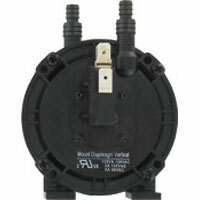 EDPS: Diaphragm material: Silicone; Housing material: Switch body: PA 6.6; Cover: Polystyrene; Materials UL 94 V-0 rated. Process and ambient temperature from -4 to 185°F (-20 to 85°C). Max. 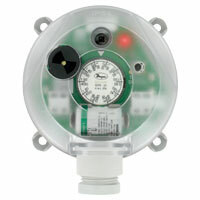 Operating Pressure: 40" w.c. (10 kPa) for all pressure ranges. Max. 1.5 A res./0.4 A ind./250 VAC, 50/60 Hz; Max. switching rate: 6 cycles/min. Push-on screw terminals. 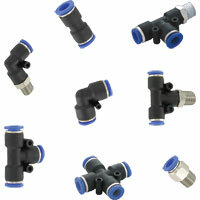 M20x1.5 with cable strain relief or optional 1/2" NPT connection. 5/16" (7.94 mm) outside diameter tubing, 1/4" (6.0 mm) inside diameter tubing. Vertically, with pressure connections pointing downwards. CE, ETL approved to UL508 and CSA C22.2#14 (EDPS only). EDPS series, can the 'delta-P' screw be used to increase or decrease deadband? The ∆P screw should never be adjusted. 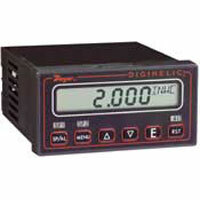 It is used to calibrate the instrument to make sure it will switch within the specified range. 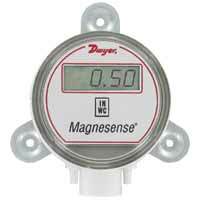 Will a Dwyer pressure switch be damaged if the pressure exceeding the maximum set-point is applied to the switch? No. 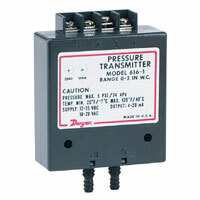 Not unless the maximum pressure rating of the switch is exceeded.